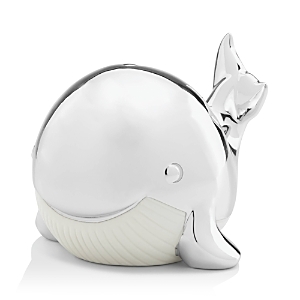 Your little one will love cuddling up to this charming sea critter. Featuring a playful print inspired by marine life, this quilt was designed by Lemon Ribbon Studio in collaboration with Anthropologie. Handcrafted from natural materials, this storage bin for your little one is equally environmentally friendly and adorable. Bohemian interior maven Justina Blakeney imbues her signature "jungalow" style into everything she creates. A play on her inspirations - jungles and bungalows - her designs are eclectic, colorful and always imaginative, and each makes a welcoming statement in your home. Here, an airy rattan chair floats above the rug in your living room or sun room, elevating your relaxation in more ways than one. After completing her degree in textile design and spending time in the United States and Spain, Daniela Orlev returned to her home in Tel Aviv, Israel to open a studio of her own. Her work explores movement and expression in painting and video works, focusing on the relationship between the human body and visual art. This thoughtful and practical bamboo feeding set includes everything a toddler or a baby needs to make meal time more fun. Mom, Dad, and Baby will just love the adorable artwork along with the sweet message about the whale-sized love we all feel for our little blessings. Make mealtime and snack time memorable and fun with this simply adorable tableware for babies and toddlers who whale always be loved. Makes a great gift idea for baby showers, first birthdays, holidays, and just because. 3R Studio offers the perfect way to illuminate your space in a charming, nautical way with the colorful striped linen shade and gilt-tone anchor embellished ceramic base of this alluring lamp Working in a small seaside village on the island of Cyprus, artist Anna Kovecses' work is characterized by organic shapes, bright colors, and simplicity. Overstuffed, comfy, and gorgeous. 56"W x 42.5"D x 41"T. Handcrafted. Softly hued ivory upholstery in a blend of rayon, polyester, and linen. Deep tonal-button tufting. Full, rounded lines. Modern nailhead trim. Down- and feather-wrapped seat and matching accent pillow. Blonde round feet. Engineered plywood frame. Perched atop the thin brass frame of this contemporary piece, modern ikat inlay aligns against a rich, indigo backdrop. Growing up in Madrid, Spain, Blanca Gomez discovered a love of art at an early age. Although she only considered it a hobby at first, she eventually transitioned to full-time work as a graphic designer for a small studio. There, she honed a skill and appreciation for blending sketching and graphic art, which informs her current aesthetic. Handcrafted chest with two drawers. Overall, 40"W x 19"D x 29.8"T. Bleached rustic figured walnut veneers. Acrylic end panels with exposed screws and bolts. Handcrafted wing chair covered in a graphic zigzag pattern. 29"W x 40"D x 45"T, with 18"T seat and 25"T arms. Hardwood frame; turquoise viscose/polyester upholstery; turquoise leather seat. Suspended coil-spring system; mortise-and-tenon frame construction. Made in the USA. Boogie Baby microfiber blanket. If desired, personalize with embroidery (up to 11 letters) in style shown. Swimming whale appliqué on front. Contrast edge. Approx. 40"H x 34"L. Cotton; machine washable. This gorgeous mango wood dresser is straight out of our dreams. With a vintage look, this sustainable mango wood dresser features 6 drawers with floral metal pulls and beveled edges. Constructed with four legs with decorative etching that will inspire your space. In a natural wood finish, this piece is perfect for organizing your essentials and displaying your favorite little treasures. Anchors aweigh! Executed in brilliant blues, the crisp stripes and anchor motifs of this simply delightful Seaside SE9 area rug from Dalyn can fill any room with a pleasing nautical atmosphere. Based in Devon, UK, artist Rosie Harbottle works as an illustrator, designer, and printmaker. Inspired by a bohemian lifestyle, her varied work uses color and pattern to evoke a sense of deep happiness and peace. Handcrafted tufted chaise. Alder wood frame. Upholstery: polyester. The fun marine animals and cheerful tones featured in this crib bedding set from Carter's lend whimsical under-the-sea style and comfort to your child's room A self-taught artist in the foothills of Alberta, Canada, Meagan Alessio brings fluffy wool to life by creating soft, loveable creatures with nothing but a single barbed needle in hand. Featuring a shimmering, metallic-embroidered mermaid at the front, this petite storage bin is just the right size for storing your little one's favorite dolls. Handcrafted transitional rug from the CALVIN KLEIN San Antonio Collection features a Scandinavian-inspired design in flokati shag pile. Hand painting on the beads of this piece give the wonderful natural weathered effect that makes the Malibu line so unique and wonderfully casual. The draped beads along the periphery lend to the understated elegance of this flush mount. Designed with the East End lifestyle collection in mind, this fixture can be easily incorporated into a transitional or coastal themed home. For a fun look and cozy feel ideal for any baby's bedroom, choose the fresh tones and Finding Nemo motif of this crib bedding set from Disney. Paper. UK Table lamp with rope detailing through base. Influenced by the bold work of Robert Motherwell as well as the color and textures of Paul Klee, Nathaniel Mather's creation process incorporates multiple media, including acrylic, oil pastel, paper, and ink. He rearranges, adds, and subtracts layers as he works, giving his work an organic, improvisational edge. Polyester, cotton; poly fill Boogie Baby towel. If desired, personalize with embroidery (up to 11 letters) in style shown. Whale appliqué on back. Contrast microfiber hood. 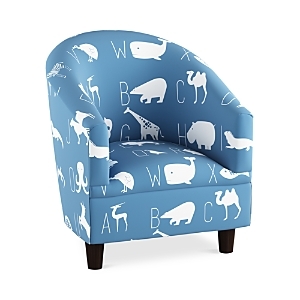 Make a big statement with this petite version of the classic barrel chair from Sparrow & Wren featuring an alphabet and animal print with endless charm The nautical-inspired theme of the Whale of a Tale crib bedding collection from Nautica brings a soothing presence to your little one's bedroom. A weathered finish gives this smooth, hardwood dresser a rustic yet refined look. Armani Junior three-piece playsuit set. Round neckline. Short sleeves with envelope shoulders. Fitted silhouette. Snap gusset. Arrives in gift box. Cotton. Tasteful, demure and elegant, this piece is perfect if your goal is to create a soft, sensual, quiet bedroom. The soft Pearl with Taupe Paint accents finish is stunning in person and will blend with any color scheme. Designed to float when taken into a bathtub or pool, this brightly-colored sea plane is made from recycled plastic milk jugs to save energy and reduce greenhouse gas emissions. Handcrafted Beatrix diamond-tufted chair. 30"W x 37"D x 38"T; seat, 17"T. Beautifully hued top-grain leather. Diamond tufting along the sides and back. Ultra-comfortable down-filled cushions. Mocha-hued hardwood legs. Mortise-and-tenon construction for exceptional durability. Made in the USA of imported material. A self-taught artist in the foothills of Alberta, Canada, Meagan Alessio brings fluffy wool to life by creating soft, loveable creatures with nothing but a single barbed needle in hand. When she isn't crafting merguins or mobiles, she keeps busy with her two young sons and their old dog Melvin - and posts brilliantly lifelike, miniature wool pups on her popular Instagram feed. The Levtex Home Marina Sea Horse Pillow includes a duck feather insert with a decorative pillow 12" x 24" in pink colors. The Marina collection features mermaids, seahorses, and other sea life motifs to make your little girl's room feel fun and imaginative. One of Apartment Therapy's Top Ten Textile Designers to watch, Erin Flett is a versatile artist and designer based in Maine. Blending traditional and modern elements, her colorful, hand-drawn pieces are a welcome addition to any home. The Levtex Home Marina Mermaid Pillow includes a duck feather insert with a decorative pillow 12" x 24" in pink colors. The Marina collection features mermaids, seahorses, and other sea life motifs to make your little girl's room feel fun and imaginative. Just ducky. A lasting treasure that baby will love. Silver. Duck with coin slot on back, sitting on platform wagon. Star-spoked wheels. Triangle design on sides of platform. The Madison Park Essentials Hudson Poly Duck Canvas Nautical Printed Shower Curtain brings a coastal flair to your bathroom decor. Displayed on the solid white ground are printed grey ship wheels along with teal, navy, and citron anchors for a charming nautical look. This coastal themed shower curtain is made from poly duck canvas fabric, making it durable, easily drapable, and machine washable for easy care. Focusing on the small wonders that enrich a quiet day, Elizabeth Mayville seeks to highlight the beauty of what's often overlooked. From her Grand Rapids home where she creates her pieces using oil and gouache paints, she explores the multiple facets of selfhood, identifying a balance between being an artist, a mother, a wife and a dog-lover. Blabla is known for its soft, hand-knit dolls that come in an array of charming characters. Paired with their small-batch children’s bedding in peaceful, modern prints, naptime never looked sweeter. Swim under the sea with the Mi Zone Kids Sealife shower curtain. Whales, fish and octopuses in bold primary colors sit atop a sketchy blue and white cabana stripe. With a cute maritime print, this lightweight, hooded poncho is perfect for your little one - after bathtime or anytime.